The Heart of the Problem is the Problem of the Heart! If the article is helpful to you, please forward it to your friends, or post it on facebook, linked in, or twitter. God bless you in your studies! If the Lord looks at the heart, then it follows that a checkup of your soul should be more critical than an examination of your physical appearance. A checkup of the soul need not take longer than a checkup of one’s personal appearance. Regular checkups will serve you well if you correct what needs attention, but often we will go for weeks or months, or even years, without checking up on our hearts. When people come into my consulting room, I can see that they have taken time to look nice. However, what I talk about is the part of them you cannot see, the world of thoughts, feelings, and emotions underneath the skin. Very few of us would think of neglecting our appearance before leaving home. We want to make the image we see reflected in the mirror acceptable to ourselves and others. We know that others make judgments about us based on our appearance. Very few people get to see what we see in the mirror in the morning. What people do see is our version of what we want them to see. Some people have more work to do than others! Multi-million dollar industries provide products for eye care, ear care, lip care, hair care, body care, and clothing. As you look in the mirror in the morning, you are vaguely aware of your behavior patterns, thoughts, and reactions. Circumstances and events in your life make you aware of pleasant or unpleasant thoughts and emotions. And as you look in the mirror, you are either pleased or displeased with yourself. Man looks on the outward appearance, but the Lord looks on the heart. Search me, O God, and know my heart; try me, and know my anxieties; and see if there is any wicked way in me, and lead me in the way everlasting. Only take heed to yourself, and diligently keep yourself [your heart] lest you forget the things your eyes have seen, and lest they depart from your heart all the days of your life. The soul is reflected in a special kind of mirror called the Bible. If anyone is a hearer of the Word and not a doer, he is like a man observing his natural face in a mirror; for he observes himself, goes away, and immediately forgets what kind of man he was. But he who looks into the perfect law of liberty and continues in it, and is not a forgetful hearer but a doer of the work, this one will be blessed in what he does. 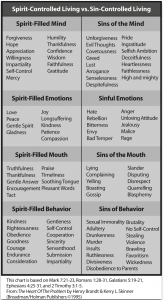 Review the “Spirit-Controlled vs. Sin-Controlled” chart below. The words on the chart come from God’s Word and therefore when you look at the chart it is like looking into God’s Word. Look through each section asking God to show you what He sees in your heart. Write your experience of checking your soul today.